The preeminence of the bishop of Rome over the entire Catholic Church, an institution known as "the papacy," took centuries to develop. Rome had always been honored for her association with Peter and Paul and her position as the church in the Empire's capital,3 but especially after Christianity was legalized under Emperor Constantine, the special status of that office grew even more with each passing Roman bishop. The doctrine of the supremacy of the pope finally reached its height in the late 13th century, when Pope Boniface VIII claimed full religious and secular authority over every human being. The article that follows traces the gradual rise of the papacy from Saint Peter in the 1st century to Pope Boniface VIII in the 13th. The bishop of Rome is the successor of St. Peter. Jesus Christ gave St. Peter authority over the entire church. Because the word "Peter" means "rock," the Catholic Church has long interpreted Jesus to be teaching that Peter is the foundation of the Church and that Peter has spiritual authority over it. (Protestants argue that "this rock" refers not to Peter but to his confession of faith.) The Matthew 16 passage is also the basis for the imagery of St. Peter guarding the gates of heaven. After the Edict of Milan granted Christianity legal status, the church adopted the same governmental structure as the Empire: geographical provinces ruled by bishops. This bishops of important cities therefore rose in power. Antioch was the place where Jesus' followers were first called "Christians"7 and, with Alexandria, was an important early center of Christian thought. Constantinople became highly important after Constantine moved his capital there in 330 CE. By the fifth century, the bishop of Rome began to claim his supremacy over all other bishops, and some church fathers also made this claim for him. The primary theological reason for the primacy of Rome is the city's association with St. Peter. Tradition held that Peter visited Rome during his lifetime and, more importantly, was martyred there. St. Peter's Basilica in Vatican City marks the traditional site of Peter's execution and burial. St. Paul was believed to have been martyred in Rome as well. There were also political reasons for the upsurge in the pope's authority. First, Rome was the historical capital of the empire and an important city politically, so it was natural that the bishop of that city would also be important. And when Constantine moved the capital of the empire to Constantinople in 330, the pope was the most powerful figure that remained in Rome. Also influential were the barbarian invasions of the fifth century. Leo I, who is regarded by many as the first pope in the modern sense, was instrumental in persuading Attila the Hun not to attack Rome in 452. When the city finally fell to the Vandals in 455, Leo convinced their leader not to burn the city. These accomplishments added to the prestige to the bishop of Rome. Moreover, when Rome fell to the barbarians in 455, the church became the defender of order, justice, and what was left of ancient civilization. The Roman bishop was instrumental in regaining the unity and stability that had been shattered by the invasions.2 In the East, on the other hand, the empire survived for another 1,000 years, so the bishops there did not have the same opportunity for political importance as their Roman counterpart. Another important development for Rome came in 756, when Pepin the Short (Charles Martel’s son and the father of Charlemagne) donated land to the Roman church. This "Donation of Pepin" established an alliance between the pope and the rulers of the future Holy Roman Empire. This important alliance culminated with Pope Leo III's crowning of Charlemagne as emperor on Christmas Day, 800. A final factor that must not be overlooked in analyzing the rise of the papacy is the personalities who held the office of bishop of Rome. These men - some of which were worldly, some of which were very devout - regarded themselves as holding a special place in Christendom and did not hesitate to claim this supremacy. During Innocent's pontificate, the Emperor Honorius moved the capital of the Western Empire from Rome to Ravenna, in northwest Italy, in 402. Rome was no longer a strong political center, and it would not regain its political strength until the rise of the papal states in the 8th century.10 Taking advantage of this weakness and the absence of a strong emperor, Alaric and the Visigoths sacked Rome in 410. As would not be the case later, the pope was powerless to stop the barbarian invasion. Leo I has been called "the master builder of the papacy. 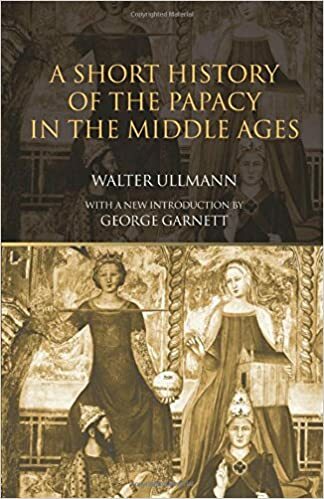 "12 He is considered by many to be the first pope in the modern sense of the term, for he put the idea of primacy of jurisdiction fully into practice. Leo was ideal for the task; by all accounts he was a good man, highly disciplined, and a true Christian. Leo took the title pontifex maximus, "chief priest," which had been used by the Roman emperors in reference to the state cult. In his writings appeared all the traditional arguments for papal authority, including the idea that Jesus had made Peter and his successors the rock on which the church would be built, and that the bishop of Rome is the successor of Peter. Several important events for the development of the papacy occurred during Pope Leo's reign. In 445, Emperor Valentinian said the Bishop of Rome was the law for all. In 451, Pope Leo convened the important Council of Chalcedon although that job had traditionally been reserved for emperors. But most important of all, Pope Leo was instrumental in saving Rome from Attila the Hun. In 452, the Huns had taken a nearby Italian city, the road to Rome was open to them, the Western emperor was weak in character and resources, and the East gave no indications it would help. It seemed certain the Huns would sack Rome, but Leo left Rome and marched to meet Attila himself. We do not know what was said between the two men – legend has it that Attila saw Saints Peter and Paul marching with Leo and threatening the barbarian. In any case, Attila decided not to attack Rome. He turned to the north instead, and died shortly thereafter. Three years later, Pope Leo saved Rome from the Vandals. This time couldn’t stop them from invading, but he led negotiations with the Vandal leader and prevented the burning of the city. Pope Gelasius was the first to take the title "vicar of Christ." He taught a dualistic power structure in which the pope held ultimate spiritual authority while the emperor held temporal authority. Gregory the Great, who is widely regarded as one of the best popes in history, fought with all his might to avoid being elected to that office. Gregory was a monk, an abbot of St. Andrew's, and he loved the monastic life. But in 590, in a time of disastrous flooding and rampant disease, Pope Pelagius II died, and Gregory was unanimously elected to take his place. Gregory begged those that had chosen him to be relieved of the election and wrote to the Emperor personally to plead that the rule not confirm the election. But the letter was intercepted and six months later Gregory received word that the Emperor had confirmed his election. The abbot contemplated flight, but he was forcibly brought to St. Peter's Basilica and consecrated pope on September 3, 590. Despite his reluctance for the job (which never abated throughout his reign), Gregory threw himself into his appointed role and became only the second pope to receive the appellation "the Great." Pope Gregory the Great organized the distribution of food to the needy, oversaw the rebuilding of aqueducts, and negotiated peace with the barbarian Lombards. In his theology, Gregory was heavily influenced by St. Augustine. The pope elaborated and developed Augustinian ideas such as purgatory and the just war. It was made public in the eighth century, but was later proven to be inauthentic and dating from after Pope Gregory by the textual criticism of Valla. Nicolaitanism (Rev 2:6, 14, 15) – breach of clerical celibacy – was common. Some married, but most just took concubines. The period of instability and corruption began to wane due to a revival at Cluny in 910. Although it was a reform movement within monasticism, it affected whole church positively. The pontificate of Gregory VII began a movement towards the peak of the papacy. Gregory made many uncontested decisions and demanded that all priests be celibate. He was also involved in the famous investiture struggle with Henry IV that ended with Henry standing barefoot in the snow at Canossa for three days until he was forgiven by the pope. The rule of Pope Innocent III represents the zenith of papal power. At his inauguration, Innocent quoted Jeremiah 1:10 in reference to himself: “See, today I appoint you over nations…” He also taught that the Pope stands between God and man as a mediator and vicar of Christ. It was on Innocent's watch that the Fourth Lateran Council developed the doctrine of transubstantiation. The Pope also showed his political power on several occasions: he caused King Philip II to take back his queen because he had unjustly divorced her; he caused another king to get a divorce because his wife was too closely related to him; and King Peter of Aragon received his kingdom as a fief from the pope. During his pontificate, Boniface was known to wear imperial robes and a richly jeweled crown, and cry, “I am Caesar. I am emperor.” Pope Boniface made even higher claims than Innocent but could not support them. He taught that the pope held both the temporal and spiritual swords, meaning that he is the ultimate authority in both realms. In his capacity of spiritual leader, Pope Boniface instituted the first Holy Year with the Jubilee of 1300: he announced a “full and copious pardon of all their sins” for all who reverently visited the churches of St. Peter and St. Paul in that year. The papacy made a great deal of money from the pilgrims who poured into Rome as a result. In 1301, tradition holds that he was visited by the great poet Dante, but this is doubted by some scholars. The Pope's story is included in Dante's Purgatorio. Boniface also oversaw a great deal of restoration of churches, revived the Vatican Library and was apparently a great lover of the arts. After another run-in in 1301, Philip's minister said Philip's sword was made of steel but the pope's was made only of words. A few months later, Boniface issued the unam sanctam, declaring that every human being is subject to Roman pope. Undeterred, King Philip prepared to depose Boniface on grounds of illegal election, heresy, simony and immorality. Several Roman churches had called for this in 1297 as well. Boniface was 86 years old and summering in foothills of Apennine Mountains at Anagni, his birthplace. Philip's troops broke into the aged pope's bedroom and kept him prisoner for three days. The people of Anagni rescued him and he was escorted back to Rome, but Boniface died within a few weeks of the ordeal. Bettenson, Henry; Maunder, Chris (eds.). Documents of the Christian Church. Oxford University Press, 1999 88, 90. Cairns, Earle. Christianity Through the Centuries. Zondervan, 1996 151-52. Coppa, Frank J.. “Papacy.” Encyclopaedia Britannica Online. 31 Dec. 2014. Web. Accessed 30 Jan. 2017. González, Justo L.. The Story of Christianity: The Early Church to the Present Day. Prince Press 242. Kirsch, Johann Peter. “Siricius, Pope Saint.” The Catholic Encyclopedia. New York: Robert Appleton Company. Argues that Siricius' decretal was not the first; just the first that survives today. Latourette, Kenneth Scott. A History of Christianity, Volume 1: Beginnings to 1500. HarperOne, 1975 118. Leo I, Pope. “Sermon 3.” Web. Accessed 31 Jan. 2017. Oestereich, Thomas. “Boniface VIII, Pope.” The Catholic Encyclopedia. New York: Robert Appleton Company. Argues that Siricius' decretal was not the first; just the first that survives today. Oestereich, Thomas. “Boniface III, Pope.” The Catholic Encyclopedia. New York: Robert Appleton Company. Toropov, Brandon. 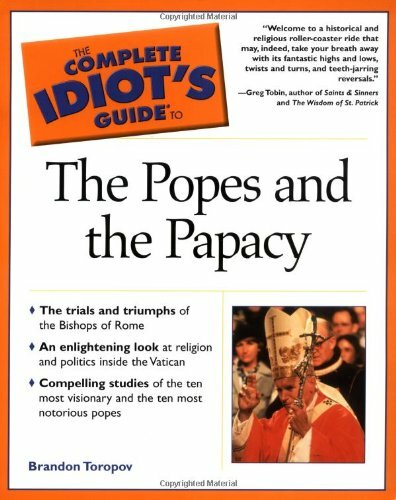 The Complete Idiot's Guide to the Popes and the Papacy . Alpha, 2001 82. “Peter and the Papacy.” Catholic Answers. Web. Accessed 31 Jan. 2017. “How the Papacy Works.” HowStuffWorks.com. Web. Accessed 31 Jan. 2017. Bruschini, Enrico. In the Footsteps of Popes: A Spirited Guide to the Treasures of the Vatican. Harper Perennial, 2009. Collins, Roger. 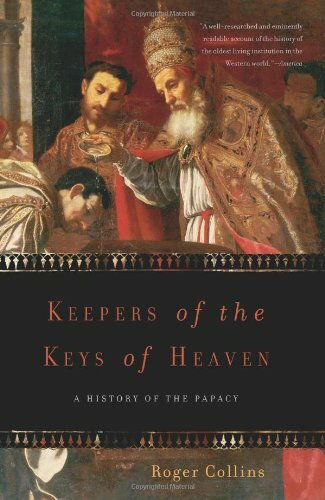 Keepers of the Keys of Heaven: A History of the Papacy. .
Department of European Paintings. “The Papacy and the Vatican Palace.” Heilbrunn Timeline of Art History. . Web. Accessed 31 Jan. 2017. Duffy, Eamon. 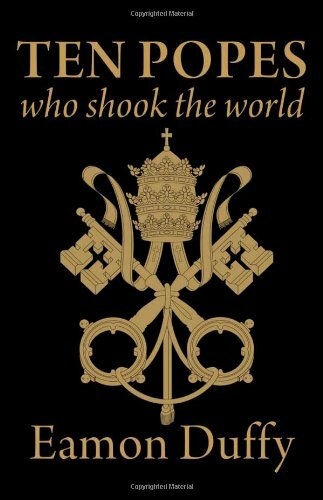 Ten Popes Who Shook the World. Yale University Press, 2001. Duffy, Eamon. 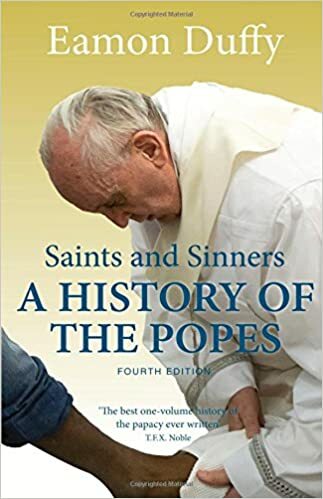 Saints and Sinners: A History of the Popes. Yale University Press, 2015. Halsall, Paul. “Internet Medieval Sourcebook: Selected Sources: Empire and Papacy.” Internet History Sourcebooks Project. 21 Mar. 2007. Web. Accessed 31 Jan. 2017. J. N. D. Kelly; Michael Walsh. A Dictionary of Popes (Oxford Paperback Reference). Oxford University Press, 2010. Lewis, Brenda Ralph. 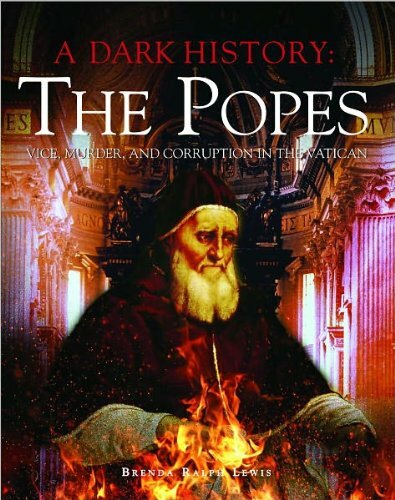 A Dark History: the Popes: Vice, Murder, and Corruption in the Vatican. .
Matthews, Rupert. 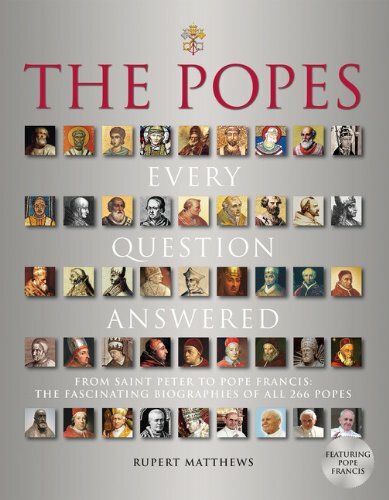 The Popes: Every Question Answered. Thunder Bay Press, 2014. McBrien, Richard P.. Lives of the Popes: The Pontiffs from St. Peter to Benedict XVI. .
Mullins, Edwin. The Popes of Avignon: A Century in Exile. Bluebridge, 2008. North, Wyatt. A History of the Popes: Volume I: Origins to the Middle Ages. .
Norwich, John Julius. Absolute Monarchs: A History of the Papacy. Random House, 2012. 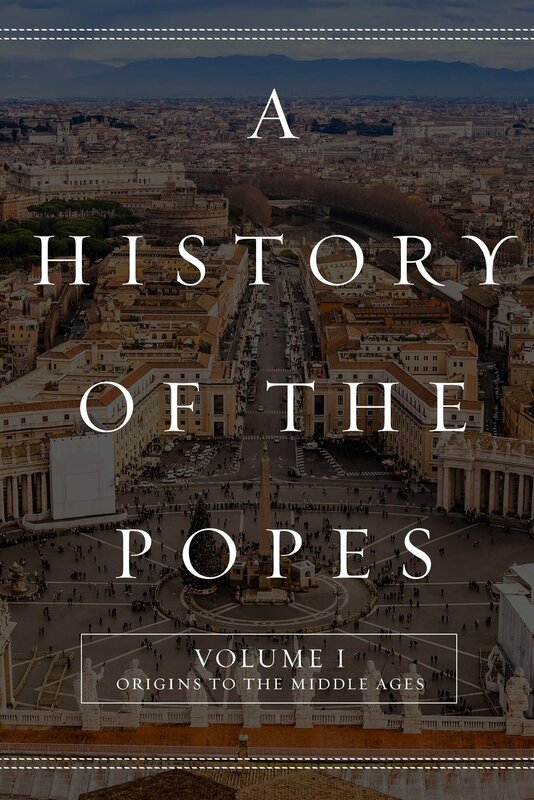 O'Malley SJ, John W.. A History of the Popes: From Peter to the Present. .
Siecienski, A. Edward. 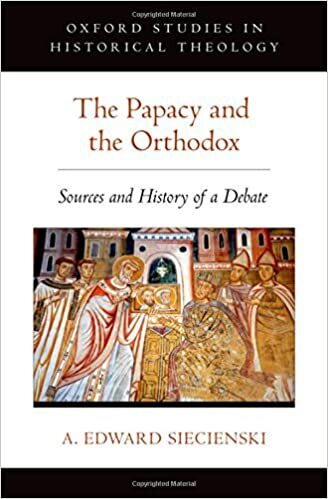 The Papacy and the Orthodox: Sources and History of a Debate (Oxford Studies in Historical Theology). .
Ullmann, Walter. A Short History of the Papacy in the Middle Ages. .
Night view of the grand east facade of St Peter's Basilica, principal church of the papacy. The Traditio Clavum: Christ gives the keys of heaven to St. Peter. Detail of Peter and Paul Window in Bourges Cathedral, dating from c.1215-25. St. Peter with his keys in a medieval fresco. Subiaco Monastery, Italy. Pope Gregory the Great in an illuminated manuscript of c. 1000 CE. St. Gallen Monastery, Switzerland. Pope Felix IV (526-30), who commissioned this mosaic for the Basilica di Santi Cosma e Damiano, Rome, Italy. Pope Paschal I (pope 817-24) with square nimbus (indicating he was still living) and model of his church on the left side of the apse mosaic. Basilica di Santa Prassede, Rome, Italy. Pope Leo IV (847-855), with a square halo indicating he was still alive at the time of the fresco. Detail of 9th-century fresco in the Church of St. Clement, Rome. Pope Innocent III and his papal bull in a 13th-century fresco at Subiaco Monastery. 15th-century statue depicting Anagni native Pope Boniface VIII. Anagni Cathedral, Lazio, Italy. 15th-century portrait of a saintly pope in a fresco at Subiaco Monastery, Italy. Monument to Pope Gregory XIII (1572-85) by Camillo Rusconi (1723) in St. Peter's Basilica, Vatican City. This pope is best known for promulgating the Gregorian calendar. The body of Pope John XXIII (d. 1963) displayed in a glass case in St. Peter's Basilica, Vatican City.